This month's SRC post comes from Angel at Angel's Home Sweet Homestead. 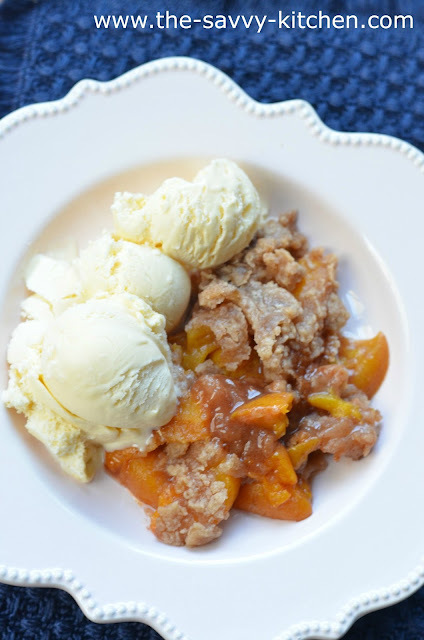 I admit I was a little intimidated going into her blog just because her recipe list is so extensive (and everything sounds SO good), but as soon as I looked in the dessert section and saw "peaches"...I was sold. Then to top it all off, it's a dessert that's done in the SLOW COOKER. Um, hello? Is that like the best thing ever or what? And it is. It's pure genius. It takes less than 10 minutes to throw together and then you let your crockpot do the rest of the work. And want to make it even easier? Use one of those crockpot liners and you won't have any mess to clean up! This recipe is yummy and it's nice to have on hand for when you have company. You won't have to worry about leaving your guests to go in the kitchen to get dessert together. Just prepare this before your company arrives and by the time dinner is over...you're good to go. Enjoy!! Grease the bottom and sides of a 6 quart crockpot and set aside. 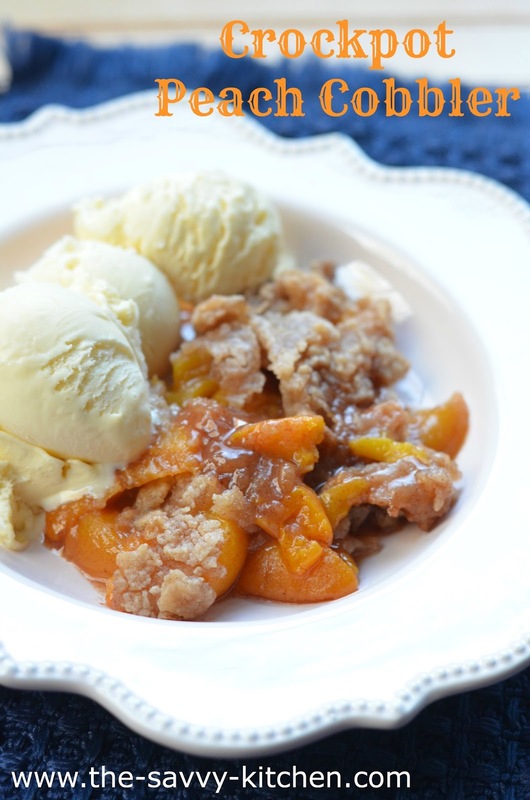 In a medium-sized bowl, stir together the peaches, 1/2 cup of the sugar, 1 tsp. of the cinnamon, and nutmeg. Pour peach mixture into the greased crockpot. In another medium-sized bowl, whisk together flour, and remaining 1 tbsp. sugar and remaining 1/2 tsp. cinnamon until combined. Cut butter into flour mixture using 2 knives or a pastry blender, until the mixture resembles coarse crumbs. Sprinkle flour mixture evenly over peach mixture in crockpot. Place a paper towel or thin dish towel over the top of the crockpot, then cover with the lid. Cook on HIGH for 2-3 hours or until the crust turns golden brown.